Some men prefer to have the ultimate shaving experience, and are willing to spend extra dollars to get the best. They want all the bells and whistles that go along with having the smoothest, cleanest shave possible. 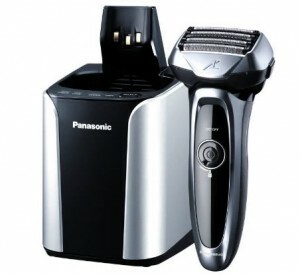 The Panasonic ES-LV95-S is a cordless, rechargeable electric shaver, that can not only be used dry, but wet as well. It also comes with a separate all-in-one purpose cleaning and charging unit. The Panasonic ES-LV95-S Arc 5 has a black and silvery grey plastic casing that is elegant, and will look attractive on your bathroom counter. The charging and cleaning station is also in matching colors. This shaver is foil style, not rotary style. It’s extremely light, weighing in at just seven ounces. There are three micro thin foils built into the head of this shaver. They will instantly capture, hold, and trim off the hairs of your face. The Lift-Tech foil will gently raise and cut those irksome hairs that tend to lie flat on the face. The Slit Blade Foil grabs and cuts those longer hairs that grow in every which way. The Finishing Foil makes a final pass and snips off those extra-thick and stubborn hairs that the two first foils may have missed. This leaves your facial skin clean and smooth. The Arc5 is from the premium luxury line at Panasonic. 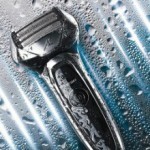 It promises a better shave above all of its other shavers on the market today. 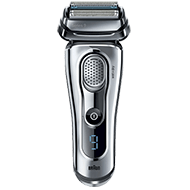 The Arc5 has a multi-flex, pivoting shaving head that moves with the curves of your face. 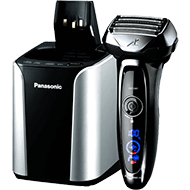 Arc5 utilizes the most advanced shaving system to date for Panasonic. The Panasonic ES-LV95-S shaving head will effortlessly float around your face, and minimize any sort of redness or irritation. You may use your Panasonic ES-LV95-S shaver wet or dry, over sink, or in the shower. It provides a perfect shave wet, but if your prefer a more comfortable shave, you can add shaving gels, foams, and other types of soaps and cleansers. It’s easy to grip in your hands, so you can’t easily drop it in the shower and damage it. You can bring it with you, so you can have a quick dry shave at any time of day. This shaver has a fast, high-efficiency, linear motor drive of 14,000 CPM. 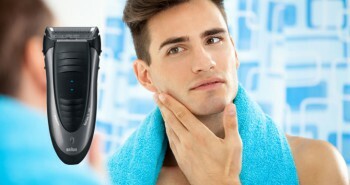 Panasonic recognizes that all hair on a man’s face is not necessarily the same. Growth and width may differ. 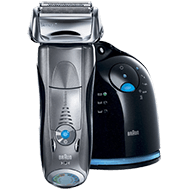 Built inside the shaver are sensors that can detect which beard density you have, whether it’s along neck, cheeks, or jawline. 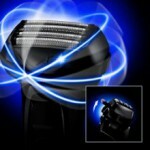 As it shaves it will automatically adjust its cutting power where needed. It will automatically accelerate around the thickest growth, and decrease around thinner growth. Arc5 is in reference to the five blades. Inside of the shaver are five precision-honed, ultra sharp, hypoallergenic Nanotech blades. These blades are also ultra-thin. This all adds up to the ultimate smooth, clean shave, with the most comfortable results. These blades each have a thirty degree cutting angle that will trim hair more efficiently to the root. The Arc5 will make it easier to shave around those hard-to-reach spots on your face. On the front of the shaver is a ten stage LCD panel. It shows the different shaver functions. One of them is a safety lock, so your shaver won’t turn on in transit. It’s simple to clean and charge up the shaver. You place the shaver head down into the cleaning unit, and press the button. It will clean your shaver, dry it, then charge it up for you. If you don’t wish to use your cleaning unit one day, you can simply rinse your shaver under warm running water. Turn on the sonic vibration cleaning mode. This will vibrate, while removing hairs that are trapped inside, as well as any gunk from soap or shaving lotions. With either cleaning method, your shaver will be ready for optimum usage by the next day. There is even a precision pop up trimmer on the Panasonic ES-LV95-S. This is perfect for trimming around mustaches, beards, and side burns. It’s perfect for adding that additional lasting touch. It takes only one hour to charge up the Panasonic ES-LV95-S. This one hour charge will give you 45 minutes of operating time, at least enough for a week, possibly more depending on your type of hair. Inside the box is one Panasonic ES-LV95-S shaver, a cleaning and recharging unit, and a travel pouch. The shaver stays charged with one lithium ion battery. 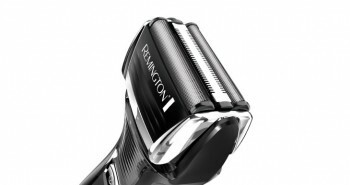 The shaver measures 2.1 x 3.8 x 6.5 inches. The Panasonic ES-LV95-S Arc5 comes at a premium price, but it’s all in the details.